For many moms, the challenge of working at home is alleviated, at least a bit, when all the kids are in preschool and school. The childcare and the work schedule are built into the day. You know when and how long you have to get certain tasks done. But if you have several kids or you have chosen to homeschool, your life is built a bit differently. You have kids home who aren’t babies, but aren’t always old enough to be completely on their own and entertaining themselves. And it’s not practical nor healthy to rely on screen time all day, every day. These ideas can also be used over school breaks, when kids are home sick (but still somewhat active), summer vacation, snow storms and more! The first thing to understand is that much of how you work during this stage of parenting is determined by your kids’ personalities. Some are more active than others. Some may just need to be right by your side, whether they tend toward quiet or chatty. Now, to be clear, I’m not excusing misbehavior. Obviously, there is training that happens BEFORE we talk about some of these suggestions below. You may need to invest some time into teaching your children some basic behavior expectations and independence and “how to be bored” skills, even. You can use and tweak many of the strategies outlined here, in my post about working at home with babies and toddlers. Some of the ideas below are definitely adaptations on this first list. For instance, if your kids have outgrown naptimes, initiate a “quiet hour” each day. Or it’s “reading time” for the olders when the the youngers nap. 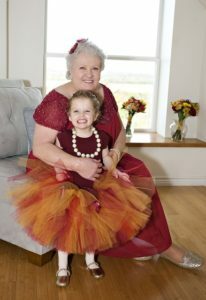 Grandparent time is great for YOU and great for your kids at any age. In fact it’s often more important as the kids grow. And trading babysitting becomes trading playdates. If you’re lucky, playdates get easier and easier as your kids get older. The kids keep each other company and you are only keeping an eye on things, not chasing them around or putting out fires. Hold out on extra special toys or games – only bring these out when you need quiet phone time or when you’re working. Make sure they’re extra fun and make it clear they’re only out for a limited time. 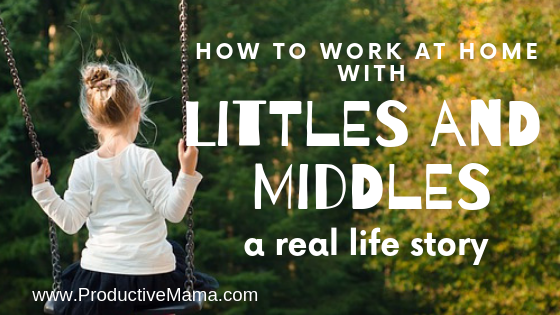 Work-play dates – do you know another mom with a business? Especially a homeschool family? Get together and let your kids play while you work together. This was such a great option for me for awhile. The kids were excited about the play time and I appreciated the dedicated time to both network just work. Teach your kids to do and stay consistent about chores – Investing the time up front in teaching your kids how to do chores begins to pay off now. When you can start removing basic chores from YOUR plate, you free up time to work. Your kids gain important and life long skills, including the ability to follow through and do a good job. Make sure they understand that THEIR contributions to the home matter because they allow you to make DIFFERENT contributions. Let them make lunch and dinner. That’s right – teach them to cook. Obviously I think you should use freezer meals, too. Then you can put a kid in charge of dumping the meal and turning on the crockpot. This would take very little training. Finish up with setting the table and you’ve taken meal time off your list and freed that time for your work. As kids get older, you should be working toward increasing their kitchen skills so that your kids can take over dinner completely some nights. Put the kids to work – Let your children help with your business. You can pay them in money or let them earn privileges, screen time, or a special outing or dessert. Be sure to explain how their task helps you and your mission. Kids can assemble and staple class handouts, stuff envelopes, label things, sort items/products, help you photograph or record items, load the car, and more. Most importantly, make sure your kids understand the value of your work. Set expectations around your work time. But also, make sure you have times you are NOT working and are focused on them.